What happens when you have random ingredients you need to use? I know I always get creative and come up with a new recipe. As you might guess, we had tons of yogurt in the fridge and a bag of crumbs from our Costco-supported Cello Wisp addiction (Cello Wisps are basically crackers made only of Parmesan cheese–high in protein and calcium, low in carbs!). 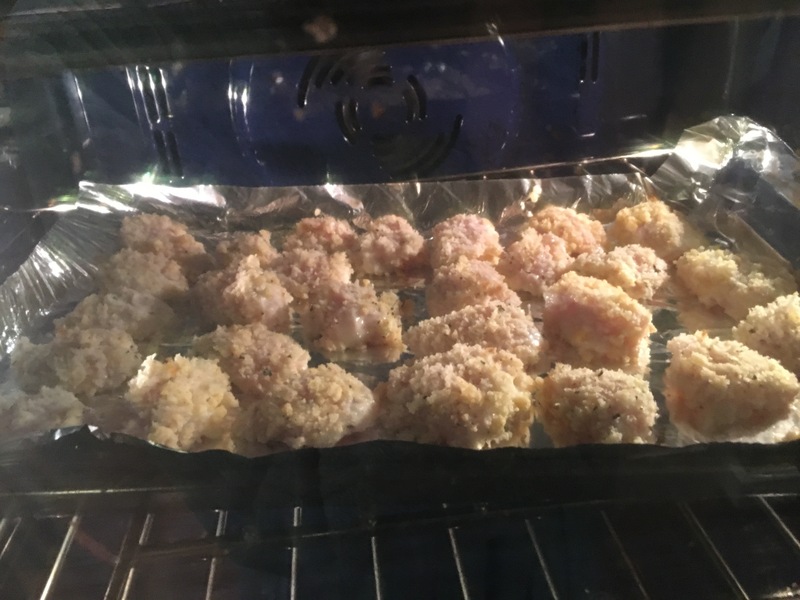 With these ingredients, I came up with this idea for baked chicken bites. I hope you enjoy them! 1) Set oven to 375. 3) Chop 2 chicken breasts into approximately 1.5×1.5in cubes. 4) Add the cubes into the glass container, cover and place in refrigerator. 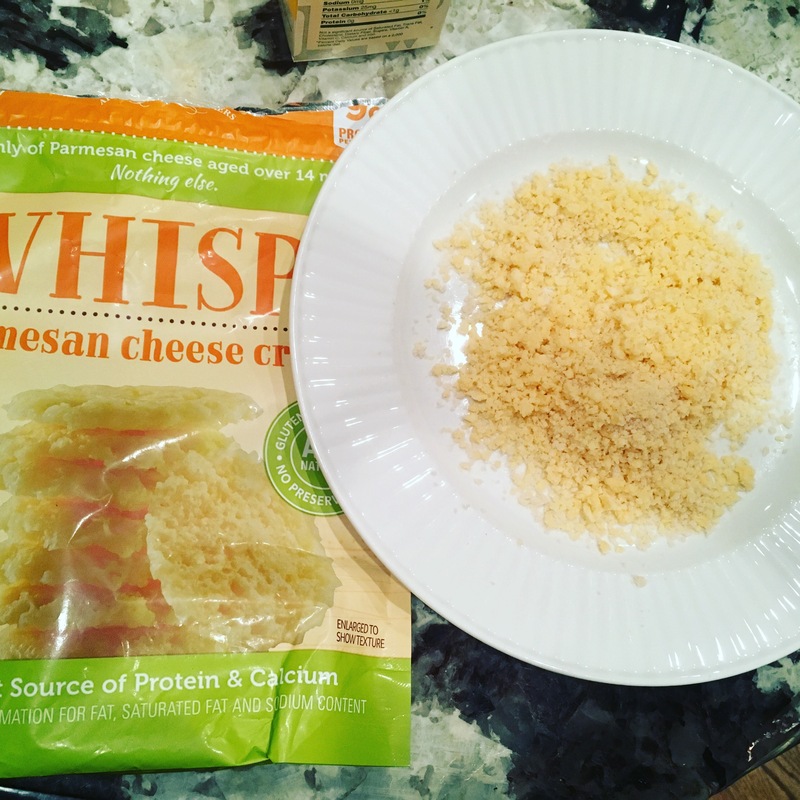 5) Now, crush Parmesan cheese cello wisps until you have 2.5-3c worth of crumbs (feel free to sub in some Panko bread crumbs). Add 2 tsp Italian seasoning and stir until well combined. 6) Pour crumb mixture onto a large plate. 7) Take out chicken cubes and dip and roll (sounds like a dance move, right?) each piece in crumb mixture until fully coated. I used a big spoon and fork to do this! 8) Place dipped cubes onto foil lined, lightly oiled cookie sheet. 9) Bake at 375 for 18 min or until chicken is cooked through. Enjoy! 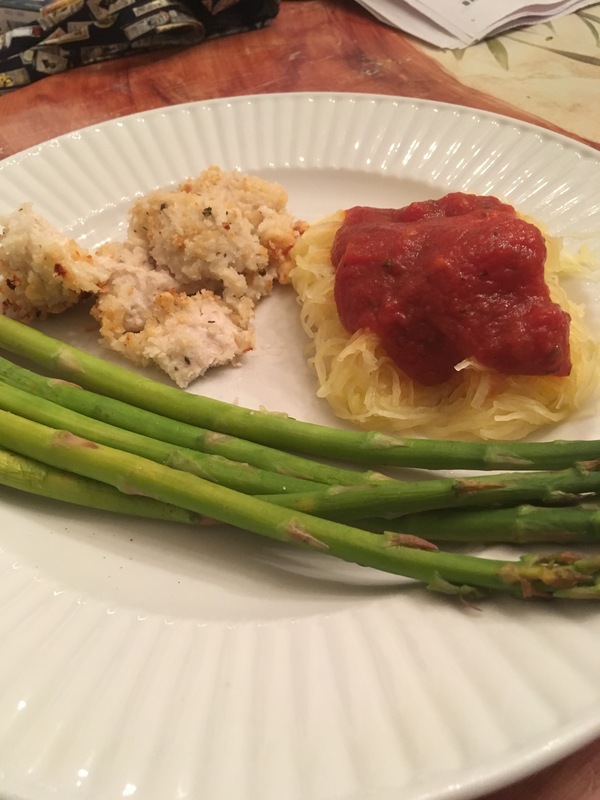 We had our chicken bites alongside roasted asparagus and spaghetti squash with marinara sauce. Previous Ted Talk Friday: “Locker room talk.” Says who? These look and sound really good! I love how versitile yogurt is! I would have never thought to bake chicken with plain yogurt. That’s pretty creative, and I love the parmesan crusting. 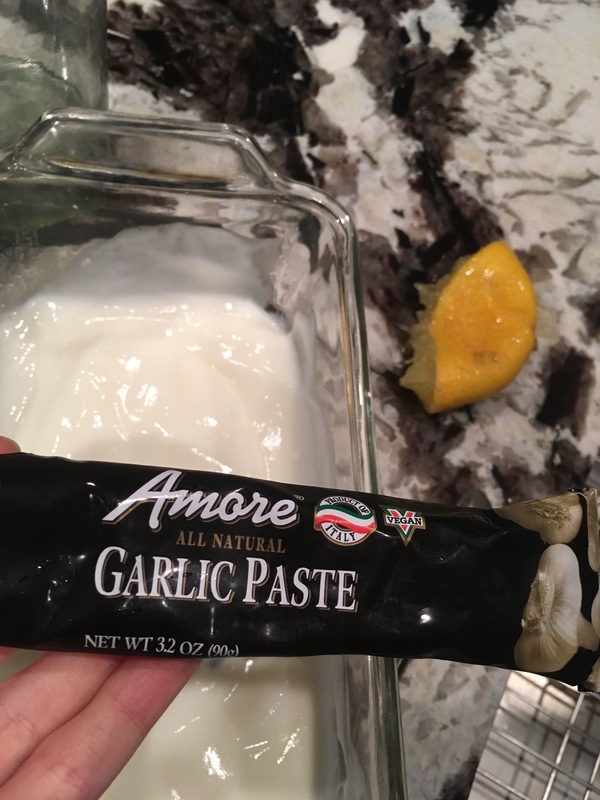 I love using yogurt in recipes. Thanks for sharing. Sounds yummy. I’m going to prepare this in comming weekend. This looks delicious! And is a great way to make GF “breaded” chicken! Yum! !